As there was already a metal band called Beowulf, it was only a question of time until one would choose the name of the villain from the epic heroic poem… not that this Finnish band is the first one called Grendel. Playing a mix of gothic and death metal, they remind especially because of their melancholic approach of their Finnish countrymen Amorphis. Although the band was started already in 2000, A Change Through Destruction is only their second longplayer. Their music is kept rather in gloomy territories and manages time and again to create, thanks to varied songwriting, a fitting atmosphere. This is contrasted by raw death metal grunts which are occasionally replaced by clean vocals, at times even running in parallel. This allows them to craft some real gems, like the doom influenced The Deaf Cult and Another Link In The Chain where the combination of melodic and brutal elements works perfectly. You won’t find any weak moments on this CD where especially the intriguing guitar work convinces. Despite many strengths, I am reluctant to give Grendel a higher rating as they fail to set themselves apart from the typical Finnish sound. The band is so full of melancholia, gloom and despair that even an illiterate person will make out their roots. 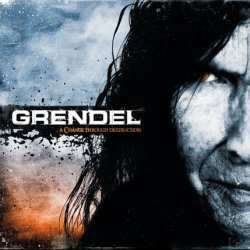 If they manage to work on their originality issues, Grendel will fare even better next time.